Civic Frame is a new form of urban infrastructure. It is sixty individual and identical units that can be combined in an infinite number of arrangements to strategically delineate - or frame - the city. Civic Frame invents a new urban typology - part public park bench and part wall - the two functions symbiotically support one another. The bench acts as the ballast to support the wall, and the wall acts as an extreme backrest for the bench. More than this, the spatial performances of the wall (to divide, to create a boundary, to obscure) and the spatial performances of the bench (to support, to slow down) collaborate in enabling a new kind of vibrant public space. Quality public space requires more than endless smoothness and open access; it also requires the ability to speak, to be heard, to look, and to listen. 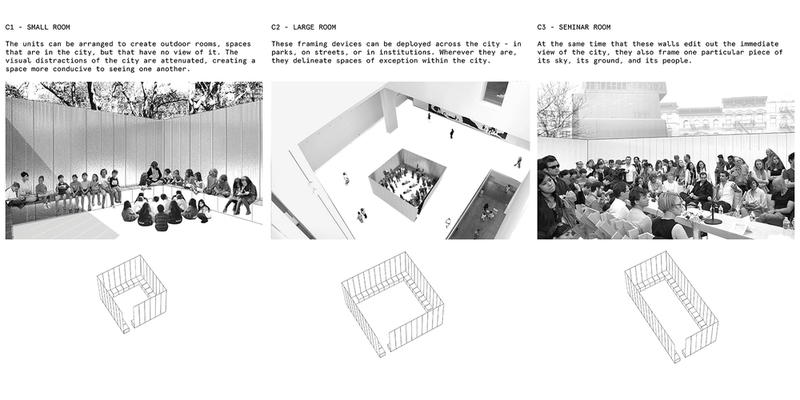 In our increasingly cluttered cities, saturated with visual noise and distraction, Civic Frame provides a flexible and participatory tool for provisionally establishing limits, edges, boundaries, and frames; empowering the urban citizen to define their own space for discussion, debate, expression, and engagement.